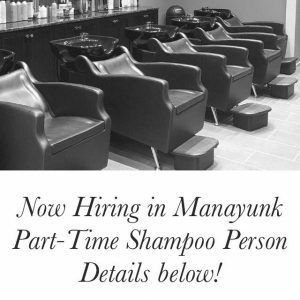 Now Hiring – Shampoo Assistant in Manayunk – Salon L.
WE ARE HIRING!! Looking for a hard working person to join our team, part time currently but with room to grow. Hours needed are Tuesdays 4-7:30pm, Wednesdays 4-8:30pm, Saturdays 10am-5pm and some Sundays as needed. Featured Express Service - Target Facials!